Beverley Knight has had her fair share of ups and downs over the past few years and when she was announced as the main support for Take That's arena tour there was the tremendous sense that this just couldn't work. 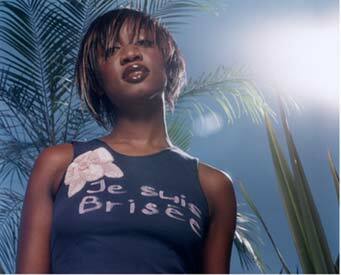 After all here was a vocalist who put the D into Diva, denounced the likes of Mica Paris who broke open the doors for Knight and then conversely seemed to be overlooked in favour of Jamelia by the record label and the general British public. When she reached the nadir of appearing in "Just The Two Of Us", car crash TV with the likes of Jo O'Meara from S Club and Russell Watson it appeared she was stuck in a rut she couldn't get out of.....so you can imagine our surprise when Knight drops the diva act, ditches the filler material and reveals herself as not only a great popstar, but one of the best popstars Britain has to offer right now. Relaxed and whooping her way through her brief but spellbinding set Knight has realized that when you're in front of a new audience there needs to be some element of interaction rather than expecting people will just sit in awe of "the voice". From start to finish it's a unbeaten setlist of classics which truly do take Knight up there with the greats and it's a timely reminder of just how many hit singles she has had. It's often been said of Knight that she's never achieved her potential but in terms of a black female artist in the UK she has little competition and if the infrastructure was set up in the UK she'd be able to compete in an international level as well. "Keep This Fire Burning" starts off with it's driving bass and snazzy strings, "Greatest Night Of Our Lives" with its disco ball pleasure and "Shoulda Coulda Woulda" a plaintive soul ballad. Only on "Piece Of My Heart" does Knight show any traces of the old diva with the intro "A song by the great Janis Joplin...tonight's its sung by me!!!" with the sort of assured confidence that comes from a woman who believes rightly or wrongly she's up their with the greats rather than just towering above the contemporary vocal talent of the last decade. Doing a live bootleg of a Luther Vandross track mixed with her own "Place Called Nowhere" before the closing "Come As You Are" she had the audience in the palm of her hands. There's never been a question of Beverley Knights vocal talent, but there's always been a huge question mark over her status as a performer and whether she was simply destined to lend her lungs on the latest Jools Holland tour knocking out cover after cover each night. For an artist who considered herself a soul singer the best thing for her career has been to go out on the road with the worlds greatest pop act and set herself the challenge of being a performer. It's a challenge she's not only risen to, but surpassed everyone's expectations on. Knight now has a very very rosy future ahead of her.